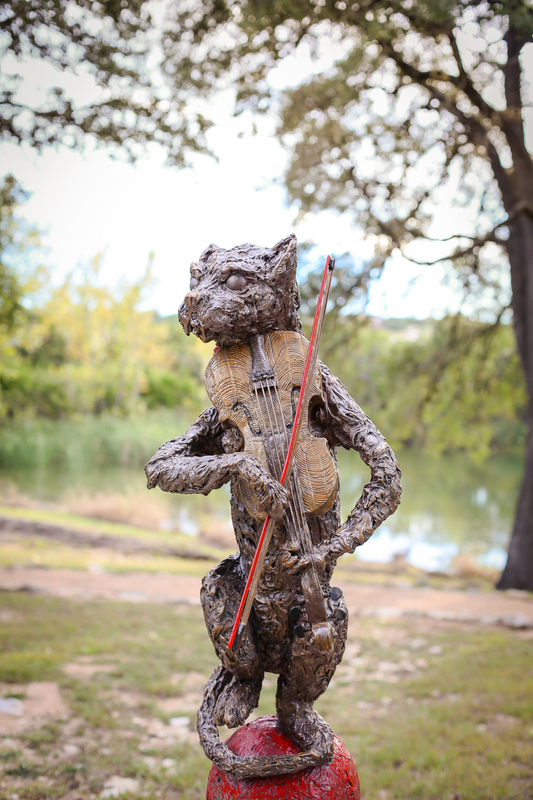 “Cat & Fiddle” is a whimsical mixed media piece of resin, concrete and steel originally created as part of a four sculpture installation for the Georgetown Public Library based on the “Hey, Diddle, Diddle” nursery rhyme. Its companion piece “Little Dog Laughs” was subsequently purchased by the Jewett Economic Development Corporation in Jewett, Texas. What is my art about? It’s about raucous joy, quiet beauty, and the humor which makes us HUMan. The price is $4,000 with a portion of the proceeds benefitting The Bee Cave Arts Foundation. Contact the artist directly if you are interested in acquiring the piece.